Studies in the past two decades have tried to answer the question as to which is the most appropriate revascularization modality to manage patients with multivessel coronary artery disease, and in particular, whether coronary artery bypass (CABG) has advantages over percutaneous coronary angioplasty (PCI) and stent implantation in patients with diabetes and multivessel disease. Findings in recent trials have confirmed the 2009 original report by Hlatky et al. who found that 5-year mortality was non-significantly lower after CABG compared with PCI. (1-5) CABG, however, has been shown to be superior to PCI for the endpoint of repeat revascularisation. One of the main problems in relation to this important question has been that the studies addressing the issue were not sufficiently powered to provide a categorical answer. A recent study by S. Head et al. in The Lancet (6), however, assessing individual patient data from 11 randomised trials comparing CABG versus PCI with stents has shed light onto the comparative potential of CABG versus PCI for management of patients with multivessel CAD. The study, involving 11,518 patients followed for almost 4 years, has sufficient power to convey as a definitive message as possible. The study reported a 5-year all-cause mortality of 11·2% for PCI versus 9·2% after CABG (hazard ratio 1·20, 95% CI 1·06–1·37; p=0·0038). In patients with left main disease, CABG and PCI performed equally with no difference in 5 year all-cause mortality between the two interventions (10·7% after PCI vs 10·5% with CABG; p=0·52) and this is a finding likely to reassure interventional cardiologists for year to come. CABG however was more effective than PCI in reducing deaths in patients with multivessel CAD i.e. mortality 11·5% after PCI compared with 8·9% after CABG; p=0·0019. Patients with more complex multivessel disease benefited significantly from CABG compared with PCI. Patients with diabetes and multivessel disease were also among those in whom CABG offered mortality benefits over PCI (mortality of15·5% after PCI compared with10·0% after CABG; p=0·0004). The results of this comprehensive and well “powered” study, which are in agreement with findings of studies carried out over 20 years ago now (7), confirm the superiority of CABG over PCI as the revascularisation treatment of choice in suitable patients with complex multivessel CAD and diabetes. Despite the important results of the Head et al. study (6) important clinical and logistic considerations by the Heart Team remain paramount regarding the decision to proceed to PCI or CABG in a given patient with multivessel disease, as highlighted by in a recent editorial article (8). Moreover, surely the advent of new –and ever more sophisticated – generations of stents will continue to challenge the role of CABG for the treatment of patients with multivessel CAD. Head SJ, Milojevic M, Daemen J, et al. Mortality after coronary artery bypass grafting versus percutaneous coronary intervention with stenting for coronary artery disease: a pooled analysis of individual patient data. Lancet 2018; published online Feb 22. http://dx.doi.org/10.1016/S0140- 6736(18)30423-9. Chaitman BR, Rosen AD, Williams DO, et al. Myocardial infarction and cardiac mortality in the Bypass Angioplasty Revascularization Investigation (BARI) randomized trial. Circulation 1997; 96: 2162–70. Bhatt D. CABG the clear choice for patients with diabetes and multivessel disease. Lancet 2018; published online Feb 22. 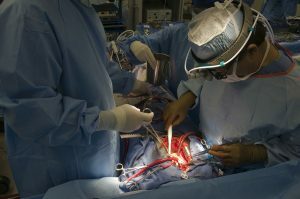 Whether coronary artery bypass grafting (CABG) or percutaneous coronary intervention (PCI) is the preferred revascularisation method in patients with multivessel coronary artery disease, particularly in those with diabetes, has been object of intense debate in the cardiovascular community for more than 20 years. In most previous studies, CABG has been shown superior to PCI in relation to repeat revascularization. The originality and strength of this study is that is the first specifically powered to assess the most important endpoint of mortality. This collaborative analysis from 11 randomized trials reports that CABG had a mortality benefit over PCI in patients with multivessel disease (5 year all-cause mortality was 11·2% after PCI and 9·2% after CABG (hazard ratio [HR] 1·20, 95% CI 1·06–1·37; p=0·0038). This effect was particularly pronounced in those patients with diabetes and higher coronary artery disease complexity (SYNTAX score had a significant effect on the difference between the interventions in multivessel disease). Also of interest, no benefit for CABG over PCI was seen in patients with left main disease. Under my point of view, the results of this study have important clinical implications. Taking in account the differences found in mortality when comparing CABG and PCI in patients with multivessel disease and diabetes who are clinically and angiographically suitable for either CABG or PCI, CABG should be the revascularization method of choice. However, physicians still need to consider patient comorbidities as well as preferences.